With the nice weather we've had this past week, things are greening up. where I am having to fill my sunflower seed feeder every 2 days. The goldfinches are arriving in packs. I wonder where they go in the winter? Probably south like I SHOULD! I have a few new visitors like this female Red-bellied Woodpecker. The male always comes around but this year, the female has been dropping in. from the patio stone wall where I place some daily seed. 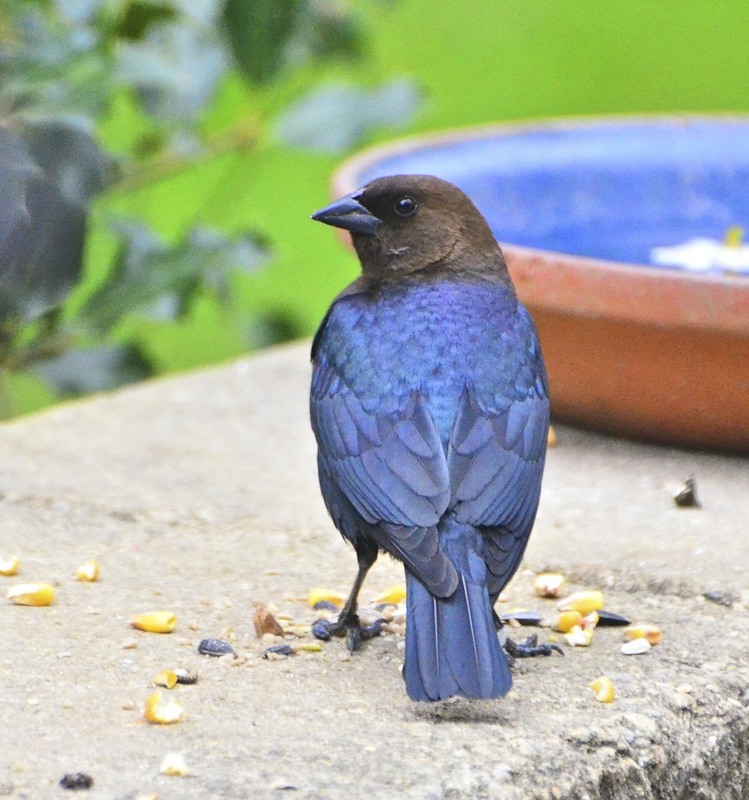 Then there is Ms. Cowbird. Doesn't she look evil?? I'm not a big fan of the cowbirds since I discovered last summer they leave their eggs in other bird's nest to raise. I had exactly that situation with a little tree sparrow that was feeding a youngin' that was twice his size. You might remember that post last July .. Even Birds Do It. It was you folks who alerted me that it was a baby cowbird, not a sparrow. Of course, the squirrels didn't go anywhere throughout the winter. But they are getting more aggressive at the feeders, with no success, I may say! When I go for walks, I pick up these walnuts and serve them up as treats. that have been making the rounds lately. Like the cat from the horse barn next door who scouts out my place now and then. Actually in this photo she is scouting out the chipmunk's place. my one and only chipmunk! "Oh, House Lady, please make that cat stay away!" have an aware and alert weekend! Make it a great one! But stay safe! Cats!!! They are cute but they are so wicked. Hope kitty doesn't find a meal at your feeder. I love this post!! Yes, Carmen does seem to be pleading with you, great caption. i love your view and all your critters and birds. i am thinking this means you do not live in downtown Philly. I do love your captures as always and Carmen does have such a cute way of pleading!! 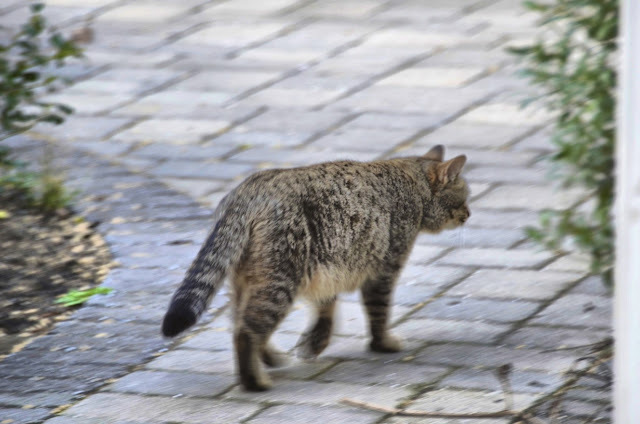 Nothing like the neighborhood cat making its morning rounds -- after all, the world does belong to them!!! A great start to my weekend and I hope you have a beautiful one, Reena! Your goldfinches come to visit me in the winter!! I'm still seeing one or two but they'll be gone soon. I have kitties that seem to have invaded our space lately. Between them and the cooper's hawk, the little one have to be on the lookout at all times. Love that view across your driveway. Morning Ms. Reena...what excellent pictures. Especially the red-bellied!! Up close and personal for sure. Cow birds are here too. Wish I could find some where to send them. oh, such cute shots! love that carmen with her tail straight up! and your goldfinches wintered here at Run*A*Round. unfortunately, we still have a whole bunch of cowbirds i could still send north! Great photos! I love the squirrel photo, she looks like she's going bowling! What a wonderful and cute surprise at the end, the adorable chipmunk!!!! I especially like your squirrel pictures today, too! The cowbird...we don't have many of them here. But you have made him look like an indigo bunting, he is so pretty and blue! Reena,I love chipmunks...and we don't have them in NC. So thank for sharing that lovely photo as well as all the rest of them. Great Great photos! 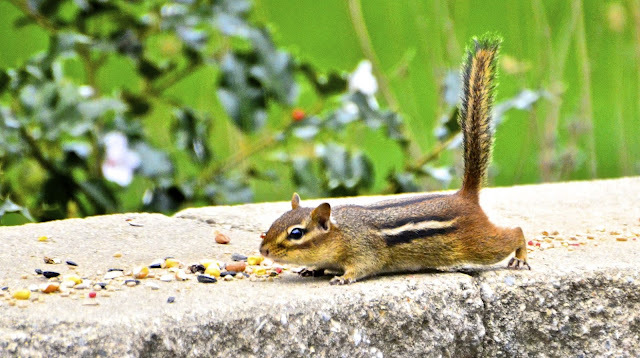 I have a few chipmunks to spare. Where should I send them? Poor Carmen she does look a little scared! Oh that Carmen is a cutie! Once again I see that everyone has prettier birds than we do. What a beautiful view across your driveway! Sweet little Carmen - I hope she can stay away from the cat. We never see chipmunks here since there are several house cats allowed to roam free. The squirrels probably can use the extra treats. I read that, because of the very mild winter, more squirrels survived until spring and there's more competition for food. Really great shots, you sure have a variety of visitors to your feeders. 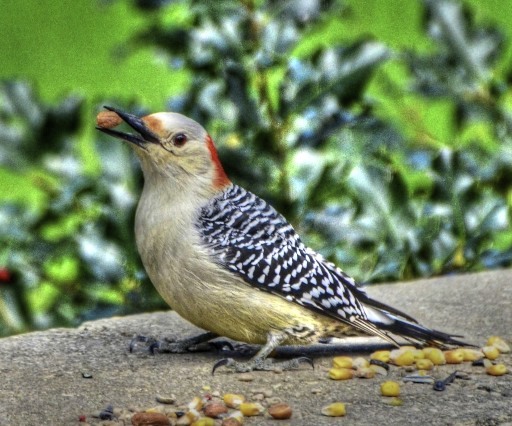 The red bellied woodpecker and the chipmunk are so cute; the cow bird is a handsome looking bird even though it takes advantage of other smallers birds. Safe and happy weekend to your too! Don't you love it when all the critters come home for spring? I hope sweet kitty stays away from adorable chipmunk! 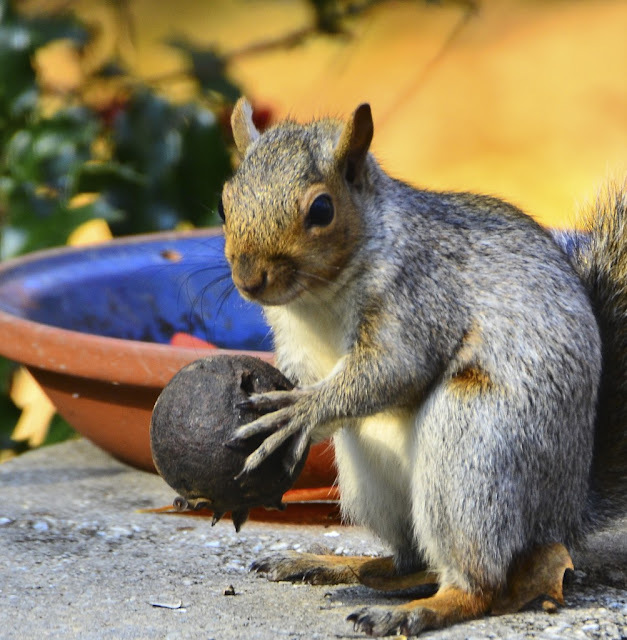 I love that you pick up walnuts for the squirrels!! That little squirrel is so darn cute.. I love that blue bird. Well it looks like a big old spring celebration is going on there. 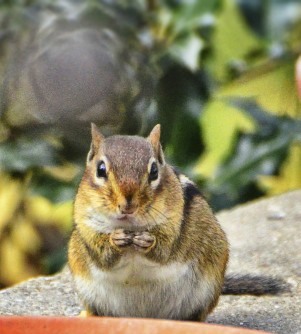 Love that picture of the chipmunk. Looking beautiful in your backyard! We recently had a problem with squirrels living under our kitchen cabinets and discovered a hole they gnawed in the siding to get into the house...the professionals who were here to advise us advised us to stop feeding the birds because we are attracting the squirrels:( Believe me they are not nice house guests! 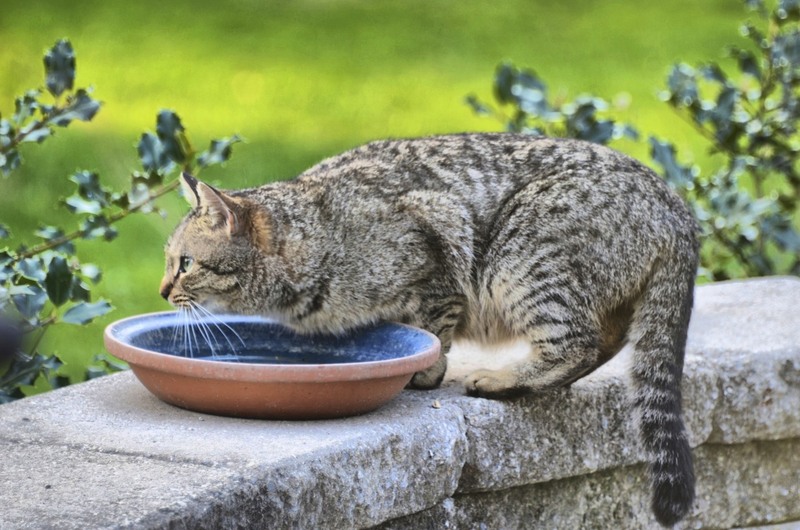 How do you keep them out of your feeders? 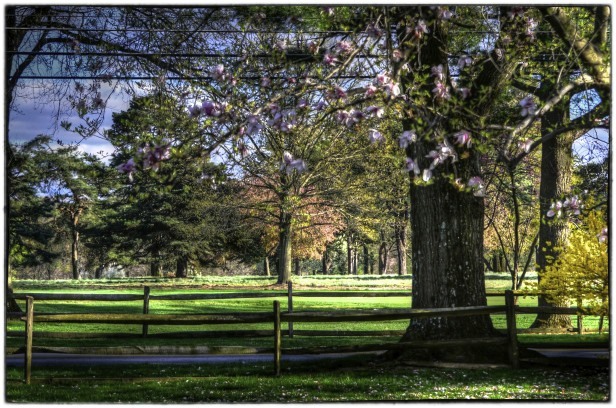 Gorgeous early-spring images. Love the birds that your feeders attract! So cute! Looks like Miss Kitty may be expecting -- more kitties to be on watch for. I love that the finches have returned and the red bellied and downy's have been loving the suet I've put out. Saw a bluebird for the first time the other day but he was gone before I could get a picture. Have a great weekend. oh i just love these posts, i am so glad i did not miss it!! each shot was my favorite, until i saw the next. your view is "park-like"!! Oh my! Carmen I hope your senses are acute. That cat looks young and strong. We have cowboys, and also, cowbirds. Reena, I love your birdies, wonderful post and photos. I hope your cute chipper stays safe from the cat. You do have a lovely view from your driveway! I hope you are having a great weekend! You have a quite a variety of birdies! We only have sparrows around right now. Hopefully there's more coming soon! 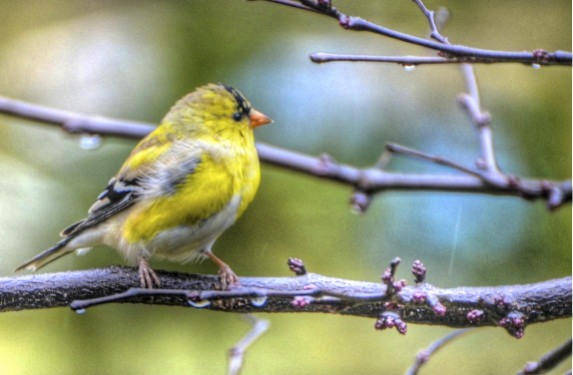 I feed goldfinches year-round....but they are really active right now, too. The grosbeaks that spent several days at the feeders have moved on, but one red-winged blackbird visits now and then. I certainly don't have the opportunity to take such wonderful shots of "individuals" as you do! you and nature get along so amazingly well....lucky us ! hi reena, i love all these cute critters and i really enjoyed reading your witty captions. ...and your view is soo beautiful. and all your delightful critters! I love the fluffed up goldfinch, but the woodpecker sitting flat on the wall is odd. Then of course, I'm always a sucker for Carmen and her family. The squirrels are just nuts here. The poor birds don't have a chance. Wonderful critter shots. I love the walnut-totin' squirrel. The squirrel has the perfect pose for the March madness basketball final. Change the background to a basketball court and color the walnut the orange basketball color. I think it would be a big hit on pinterest. I love all the changes the spring brings, and I think you have read Carmen Chipmunk's mind perfectly! I do remember about the 'ugly duckling' with the sparrows last year--I wonder when it found out it was really a Cowbird?